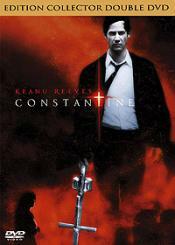 John Constantine is approached by Det. Angela Dodson who needs his help to prove that her twin sister Isabel's death was not a suicide. The dead woman was a devout Catholic and Angela refuses to accept that she would have taken her own life. She's asked Constantine for help because he has a reputation for dealing with the mystical. In fact, he is a demon hunter whose sole purpose on Earth is to send demons back to the nether regions. John himself has been to Hell - as a young man he too committed suicide and now knows that he is destined to return there on his death - but hopes that his good deeds may somehow find him a place in Heaven. As he looks into Isabel's death, he realizes that demons are trying to break through to the human world and his battles lead him into a direct conflict with Satan. This page has been seen 9414 times.